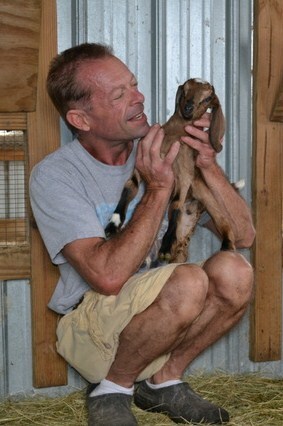 When we decided to move to the country our original intent was to buy or set up a dairy goat farm. We love Greek style yogurt, specialty cheeses and ice cream. Jay grew up raising and showing goats in Montana so goats are one of the loves of his life. It took us longer than we wanted but we're finally making this part of our dream come true. 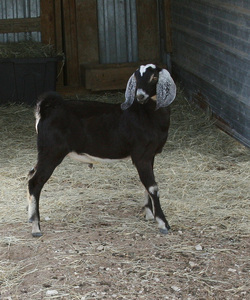 Currently we have 12 purebred Nubian dairy goats. Nubians are originally from north Africa and the Middle East so they tolerate the extreme heat of Texas summers. They can be characterized by their long floppy ears, roman nose and large size. 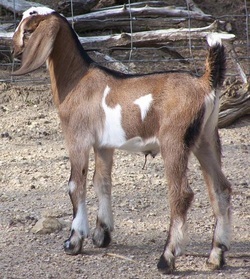 It's been said that the Star Wars character Jar Jar Binks was modeled after the Nubian goat. Female goats are called does and can weigh around 135 lbs and male goats called bucks around 180 lbs. Minimum height at the top of the shoulders is 30 inches for females and 35 inches for males. Although this breed produces less milk than other dairy goat breeds they are known for the high butterfat content of their milk. We spend considerable time with our goats so they are gentle, very friendly and easy to handle. In a way goats are like dogs except they sleep in the barn. They seem to enjoy our visits with them and they are very attentive when we talk to them. To identify them Jay has given each one a Japanese name based on their markings or their personality. This male goat is called Yagi which is the Japanese word for goat. He is a very masculine black male with silver ears. Quite the very handsome fellow, all the girls enjoy his company. Often he impresses the girls with his frolicking and jumping. We are impressed with his muscles and sheer power so have halter trained him and encourage him to come up for neck rubs or snacks. Since a solitary male goat often becomes mischievious we decided to get a companion male for Yagi and to have some genetic diversity in our offspring. This young male is also quite masculine and acts like he owns the ground he walks on. We think he is quite attractive and so do all our girls. Shika is the Japanese word for deer. With his coloring and mannerisms this buckling reminds us of a deer. We call him Sheik. The first females we acquired were these twin sisters. Their markings are called moon spots and it is our favorite coloring. The one in front is our alpha female and is called Takara which is the Japanese word for treasure. Her slightly smaller twin sister behind is called TenTen. Ten is the Japanese word for spot so spot spot is TenTen. This moon spot female Nubian is called Yume (You May) which is the Japanese word for dream. She is one of our most pleasant, outgoing and friendly goats - a real dream to be around. The Japanese word for stripe is Shima. Because of the vertical stripe around each side of her torso you can see why we call her Shima. Goats love jumping up on higher objects to play 'king of the mountain'. We have a couple wood spools and other objects for them to play on. This female Nubian seems to have been magically marked. She has vertical stripes down her face, rings around her knees, moon spots on her body and markings that look like a map of the world on her left side. We call her Chizu which is the Japanese word for map. Moon spot female Nubian in the background is called Tsuki which is the Japanese word for moon. Red-brown female in foreground is called Sakura which is Japanese word for cherry blossom. This female is very friendly and very curious. She is always poking her face into whatever it is that we are doing. Nubian goats are easily identified by their long floppy ears and roman noses. Long ears help dissipate body heat to keep them cool during hot weather. Chizu and Sakura are best buddies and always ready to greet any visitors. When Sakura turned her head to look up our friend Donna was able to take this exciting photo. Guzel is two days old and already jumping and down on the bales of straw in the nursery barn. This little guy is very photogenic. Photo by Crystal Buckey. Michael came up with the name Selim for this little guy. Selim is the Turkish word for Safe. His name seems very appropriate since we consider our farm a safe haven.